The Samsung Galaxy Y may be low cost, but it's low spec too. We'll bring you our final verdict when we get a fully-working review sample of the Galay Y in. We've now updated our review to reflect our findings with a fully working version of the Samsung Galaxy Y - including a price drop to under £90. Samsung wants to cater for a range of users, not just those wanting the biggest, fastest and most media hungry phones and the Samsung Galaxy Y looks to bring functionality to the low-end range. The 'Y' stands for 'Young', which clearly signals the market this phone is targeted at. The Galaxy Y sells itself as a budget Android device which allows you to keep updated on the go, from poking your friends to tweeting what you had for lunch. The Samsung Galaxy Y replaces the Galaxy Mini at the bottom of the Galaxy range and this puts it head to head with the Orange San Francisco 2, HTC Wildfire S and Alcatel One Touch 990. The Galaxy Y is low on specs, but this means it is also low in price – available for free on contracts starting from just £9.99 per month, or £90 on PAYG, making it very competitive. A SIM-free option will set you back around £115. 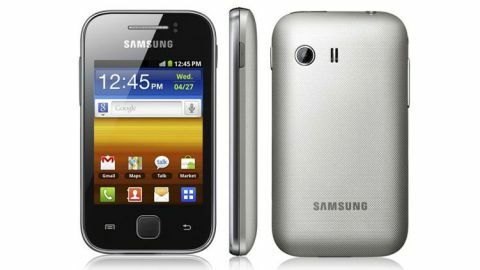 The Galaxy Y is a dinky device measuring 104 x 58 x 11.5mm and housing a 3-inch QVGA (240x320) TFT touchscreen. You'll notice that the screen is certainly petit, but Android 2.3.5 (Gingerbread) still works well – albeit looking rather grainy due to the low-res TFT display. Pick the Galaxy Y up and it sits nicely in the hand; the rounded textured back provides a comfortable and firm grip while weighing in at 97.5g grams giving a solid feel without seeming heavy. The build quality of the Galaxy Y is sturdy with no flex in the handset when pressure is applied. The back cover is plastic but it fits snugly on the phone and when removed feels thick enough not to be a worry. Flip that handset over and you're greeted with a 2MP camera and speaker, which has a raised grill – bit of an odd feature but is likely there to provide a bit of distance between the lens and a surface when placed on a side. There is just one button on the right hand side which is the power/lock key. Thanks to the Galaxy Y's small size, it is easy to reach when using one handed. Move to the top and there is a 3.5mm headphone jack and a covered microUSB port. Providing you have not bitten your nails off, the cover is easy to remove. On the left of the handset there is a volume rocker switch and hole where a lanyard can be fitted - if you're in to that sort of thing. The is not much happening on the base of the Galaxy Y, just a microphone pin-hole and a dent in the chassis to allow you to take the back cover off – which we did with ease. Back to the front and it's the classic Samsung three button combo below the screen, with touch Back and Menu buttons flanking a physical Home button. The Home button has a premium textured look and feel which seemed out of place on the budget Galaxy Y. It made us shudder if we caught it with our nail, as it felt like scraping your hand down a blackboard. We also found the touch buttons quite unresponsive, requiring firm taps to register. Under the hood there is an 830MHz processor powered by a 1200mAh battery. The Galaxy Y is not going to be winning any speed races and it shows when using the phone with it slow to start up and load apps, but we expect this from cheap handsets. Samsung has stuck a miserly 160MB of internal memory inside which can thankfully be upgraded to 32GB with a microSD card. Granted it's a budget handset, but even the San Francisco 2 and Wildfire S offer 512MB.